Fernando Alonso says Lewis Hamilton will find his second Formula One season easier and could even win the title. Last season Alonso and Hamilton had an intense rivalry at McLaren and tied on points, with Hamilton taking second in the championship behind Kimi Raikkonen. But Alonso told the BBC: "After one year's experience things become easier and that will give him an advantage." Asked if Hamilton could win the world title, Alonso, who has now returned to Renault, said: "Possibly, yes." Hamilton surprised almost everyone by winning four races and coming to within a point of the drivers' crown in his unprecedented rookie season. Alonso now expects the 23-year-old to open his season in Melbourne on 16 March armed with the lessons learned from a battling season. 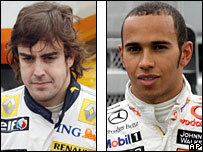 "After a year, you know all the circuits and how the races go," Alonso, 26, said. "You understand the pressures so there are many things that will give him an advantage compared to last year." However, Alonso, who also won four races last season, believes Ferrari's defending world champion Raikkonen remains favourite for the 2008 crown. "The two Ferraris and two McLarens will be able to fight for the championship," said Alonso. "But if I have to name one then Ferrari and Kimi because he is the world champion and will be the driver to beat. "At the end of last year, Kimi had some very good final races, and was also lucky, to be world champion being so far behind. "But he has the self confidence and he is obviously very quick, so he has put himself in a very strong position." Alonso has himself been linked with a future move to Ferrari but after a bruising season at McLaren he cut his contract short to return to Renault. The Spaniard joined forces with the French team, who gave him his first Grand Prix win in 2003, to take both the drivers' and constructors' titles in 2005 and 2006. However, after Renault's mediocre showing in pre-season testing, which saw them some way off the pace of the Ferraris and McLarens, Alonso remains realistic about his chances of finding himself in the title hunt for a fourth consecutive season. "It will be difficult to repeat the successes we had and it will of course be a frustrating season not to lead the table," said Alonso. "But I will do my best and I know the team will do their best to produce good cars so we will see. "The new R28 car is a step forward but we are still not at the level to win races, so we need more time and some clever ideas. "We will set new targets for each Grand Prix; maybe it's not a victory, but first it will be the top five, then the podium and then we'll see. There will always be some motivation." Despite Alonso's modest expectations for the season ahead, the Spaniard again insisted he had no regrets about leaving McLaren. As well as his rivalry with Hamilton, both on and off the track, his relationship with McLaren team boss Ron Dennis also deteriorated; first over driver status within the team and then when Alonso threatened to reveal incriminating emails about McLaren's knowledge of confidential Ferrari data. That threat eventually led to the team being stripped of all their points in the constructors' championship and fined £50m. "I was lucky to have a competitive car again and to be able to fight until the last race," said Alonso. "I've still got good friends and a good relationship with the team; you build up good relationships with your engineers and mechanics." When asked if Alonso was also friends with Hamilton he replied: "Maybe that's not the right word. "I don't think there are many friends in Formula One between the drivers. "We have a lot of respect for everyone. Sometimes we say hello, we shake hands, we talk about races when we meet, but we don't go out to dinner or the cinema with anyone; not with Kimi, not with Massa, not even (Renault team-mate Nelson) Piquet. "I think outside of F1 we are quite close to our family." Alonso did, however, show support for his former team-mate Hamilton, who was subjected to racist abuse during a testing session in Barcelona earlier this month. McLaren was taunted by a section of Spanish fans and motorsport's governing body, the FIA, has since launched an anti-racism campaign. "I don't know much about what happened, only what I read in the press," said Alonso. "But if that happened we have to be very clear on that and that needs to stop." Alonso also repeated his view that Spain is not a racist country. The double world champion was speaking in Barcelona during a three-day test which also saw the return of seven-time world champion Michael Schumacher. The German, who retired in 2006, was testing Ferrari's new car in his advisory role for the team, and Alonso said he would welcome Schumacher making a more permanent return to the sport. "The fans would love it and it would increase the attention on F1, so it would be good for the sport," said Alonso. "It would be an interesting championship again as he would be one of the maximum contenders, but I don't know if he wants to come back." You can hear Brian Alexander's interview with Fernando Alonso on Thursday night's Five Live Sport at 7pm.